I love finding recipes and trying them. What I love even more is finding recipes that are healthy and still delicious. Last week I stumbled on a site called, Skinnytaste. It's has become one of my favorite sites to get recipes from. The pictures are beautiful, but most of all the food she posts are healthy and fits right with my weight watchers plan. She lists the nutrition along with the new and old point system for those of us that are on weight watchers and not to mention the serving size. How awesome is that? This is just one of the few recipes I've tried so far from her site and my family and I thought it was just delicious so of course I had to share it with you. Enjoy! Cook brown rice according to package directions in water along with a chicken bouillon, 1 bay leaf and 1/4 tsp salt and 1/8 each of salt, cayenne, paprika and thyme. When the rice is almost done cooking, heat a large heavy saucepan on medium-low heat. Add the oil, onions, green pepper, celery, bay leaf and garlic. Sauté on medium-low heat until soft, about 5 minutes. Add beef, salt, black pepper, remaining paprika, thyme and cayenne pepper. Sauté until browned, about 10-15 minutes; add shrimp, cover and cook 5 more minutes. 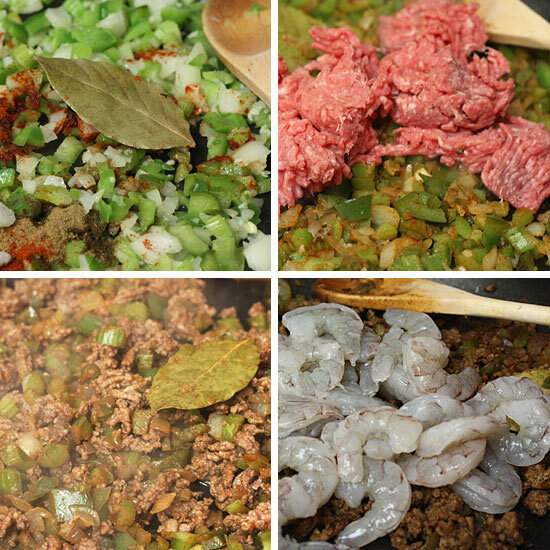 When the rice is done, toss with beef and shrimp and combine well. Top with scallions and serve. I am just not a shrimp (or any seafood really) fan. This does look good though so I'm wondering if I could substitute the shrimp for some chicken or even tofu? This looks good but I am with Kelly no seafood for me. I am thinking chicken would be a great substitute though. YUM! This is a dish my Dad often makes! Love it! Thanks for sharing the recipe! He won't tell me his! He just says, "Watch and learn!" LOL! Always looking for filling, tasty and fun food. Thanks for the recipe and the site! Can you believe I have never tried shrimp? One of these days I really must give it a try. OMG does that look awesome. Must try...especially if it came from a website with the word "Skinny" included. Ummm, do you go house to house with this or do I have to figure it out for myself? ?